The Roman politician and general Mark Antony was the chief rival of another prominent Roman politician, Octavian (63 B.C.E. –14 C. E.), seeking leadership of the Roman Empire. Both men desired to assume power after the assassination (political murder) of Julius Caesar in 44 B.C.E. The man who came out on top of this struggle would go on to become perhaps the most powerful figure in the world at that time. Mark Antony (in Latin, Marcus Antonius) came from a distinguished Roman family. His grandfather had been one of Rome's leading public speakers, and his father, Marcus Antonius Creticus, had died in a military expedition against pirates when Antony was young. As a young man from a distinguished family, Antony received an appropriate education. His studies focused on skills that would be useful to him later in politics, such as the art of public speaking and the ability to think about a question or situation objectively and from many angles. All his life, however, he was known for mixing such activities with a love of less serious pleasures. At an early age he became known for the personality traits he showed later as an adult: he was brave, loyal to friends, athletic, and attractive, but he was also reckless, occasionally lazy, fond of drinking and carousing, and involved in love affairs. 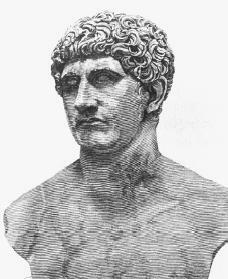 Antony received his first overseas experience in the eastern portion of the Roman Empire, when, during 57 to 55 B.C.E. , he served with the Roman governor of Syria, which was a province (territory) of Rome. From there he went to serve with Caesar (100–44 B.C.E. ) in Gaul (a region of Europe that included what is now modern-day France, as well as parts of modern-day Germany, Belgium, and Italy). Caesar conquered Gaul for Rome, and Antony assisted him in suppressing local rebellion against the Romans. In 50 B.C.E. , after returning to Rome, Antony was elected a tribune, an office that represented the people's interests. Tribunes were expected to stand up for the rights of individuals and for those who were not members of the highest classes of Roman society. By contrast, the Senate, Rome's primary governing and advisory body, was composed primarily of members from a small hereditary aristocracy (political upper class). Antony came into the office at a critical time. Caesar's command in Gaul was coming to an end, and a group in the Senate was set on bringing Caesar to trial for what they saw as his misuse of his power. Caesar depended upon the tribunes to look after his interests in Rome, and Antony did so when he vetoed a decree that required Caesar and the men he commanded to lay down their arms. However, when the Senate gave its officers special powers to "preserve the state," Antony felt that the measure would be used against him and he fled to Caesar. By doing so, he gave Caesar the opportunity to assert his power, because he could claim he was defending the people's representatives—the tribunes—against the power of the Senate. A series of civil wars followed that pitted Caesar and the armies and politicians loyal to him against the forces of Pompey (106–48 B.C.E. ), the leader of the Senate faction. Under Caesar, Antony was given several important military assignments and distinguished himself. After Caesar defeated Pompey, Antony returned to Italy as Caesar's second in command. In 45 B.C.E. Caesar designated him as consul (a one-year position that was one of the most powerful in Roman government) for 44 B.C.E. Once again Antony found himself in a key position at an important time. Caesar was rapidly moving in the direction of a government in which he would hold king-like powers. As a result, a plot formed to eliminate Caesar. On March 15, 44 B.C.E. , he was assassinated. Antony was spared on the grounds that the aim of the plot was to remove an illegal ruler, and that killing the consul, who was the chief legitimate officer of the Roman state, would reflect poorly on the cause. With Caesar's death, Antony was forced to fight a two-front war. One front was against those who had plotted to kill Caesar. The other was with Caesar's supporters, who were undecided on how to avenge Caesar and as to who would lead them. Antony might have ensured his leadership without difficulty if the young Octavian, nephew of Caesar, had not appeared, claiming to be Caesar's adopted son and heir and also demanding to be given Caesar's political power. Antony tried to strengthen his position by attempting to gain a new five-year command in Gaul, but Octavian skillfully lured some of Antony's legions (the largest unit in the Roman military) to his side. In the clash that followed, Antony's forces attacked Decimus Brutus (a leader of the plotters), but he was in turn attacked by the armies of Octavian and the consuls. He was defeated and forced to retreat north. In the following months Antony strengthened himself with the armies of the western Roman Empire; while Octavian, realizing that the Senate was trying to use him, began to establish an alliance with Antony. The result was the formation of the Second Triumvirate of Antony, Octavian, and Lepidus (c. 90–13 B.C.E. ), another of Caesar's former officers. As a triumvirate (consisting of three governing officials called triumvirs), they assumed absolute authority for ruling the empire, although Anthony and Octavian soon edged Lepidus out of power. Unlike an earlier triumvirate consisting of Caesar, Pompey, and the politician Crassus (c. 115–53 B.C.E. ), which was a mere political alliance, the Second Triumvirate became a constitutionally established body for ruling the state. Octavian assumed control in the west, Antony in the east, and Lepidus (for a time) in Africa. Antony and Octavian now moved eastward to face the army of those who had killed Caesar. The two forces met at Philippi, Greece, in 42 B.C.E. , where Antony's military skill led to victory. After this battle Antony's career entered its most famous period. While Octavian returned to Italy, Antony went east to put affairs in order in the eastern provinces. He also prepared a war against Parthia (located in present-day Iran), and, needing Egyptian support, he met with Cleopatra, queen of Egypt, in 41 B.C.E. An immediate romance followed. This was interrupted when the news arrived that Antony's brother and wife were openly defying Octavian in Italy. Antony moved back west and peace was patched up in 40 B.C.E. with Antony's wedding to Octavian's sister, Octavia, after the death of Antony's first wife. Antony soon went east again, beating back the Parthians. In 36 B.C.E. he again took up his affair with Cleopatra, becoming involved with her both romantically and politically. Cleopatra saw her alliance with Antony as a wonderful opportunity to revive the past glories of the Ptolemies, the royal family line from which she was descended. What Antony's ideas were is not clear. He was certainly was dependent on Cleopatra for money, and he did cede (give) territory and grant titles to Cleopatra's family. At the close of 33 B.C.E. the Second Triumvirate legally came to an end. At the same time the crisis between Octavian and Antony was reaching a climax. Antony still had support in Rome. Octavian turned public opinion against Antony, however, doing so by announcing Antony's divorce of Octavia for Cleopatra, reading Antony's will (in which his strong ties to Cleopatra were stressed), and starting rumors against Antony. Octavian gathered support in Italy, while Antony's Roman friends had mixed emotions about waging war on the side of the Egyptian queen. The two men and their armies met off at Actium, Greece, on September 2, 31 B.C.E. In a confused battle Antony's fleet was defeated. He fled back to Egypt with Cleopatra. Upon Octavian's arrival in Egypt, Antony committed suicide. Octavian went on to become the first emperor of Rome, taking the name Augustus. Huzar, Eleanor Goltz. Mark Antony, a Biography. Minneapolis: University of Minnesota Press, 1978. Reprint, Dover, NH: Croom Helm, 1986. Roberts, Alan. Mark Antony: His Life and Times. Worcestershire, England: Malvern, 1988. Southern, Pat. Mark Antony. Stroud, England: Tempus, 1998. Weigall, Arthur. The Life and Times of Marc Anthony. New York; London: G. P. Putnam's Sons, 1931. This article made me so happy! (; I loved how it talked about Cleopatra! I think should be be like so fine if she were still live. I love this, so helpful!!! I have to write an essay on Marc Antony and this is my main source. The information on the war against Pompey is a little confusing, but besides that this is a great piece of writing. I would like to know more about him and his father and how was their relationship.